This year, we are shaking things up. The last two years we celebrated the 4th of July with flyovers, but this year we are doing something different – we are Playing in the Sand! 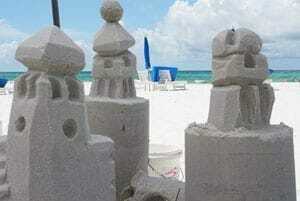 The Carillon Beach Institute is pleased to sponsor a special sandcastle event tomorrow on July 4th. We welcome your artistic flair and sandcastle skills to create a “4th of July” inspired work of art – ONLY fitting for the finest of sea kings and queens! Registration is free. Once you register, you will receive a special Carillon Beach surprise, a US Flag that will be used to identify your castle as an event entry, and a unique number to identify your team. Registration is available TOMORROW (July 4th) on the Village Green, after the 4th of July Parade. Single and Multiple families may register. This event is open to homeowners and renters in the Carillon Beach community; however, the work cannot be larger than 6’ X 6’. The sandcastle entry must be constructed with all natural artifacts, found on our beach or in the water (shells, driftwood, sea grass, etc.). No dye is permitted – or anything else that may harm the environment. Remember – we are in turtle season! Sandcastle construction and/or sculpting must feature both the US flag and the yellow number flag you are given to mark your official entry. Judging will start at 4pm, beginning at Walkover #8 and finishing before 6pm at Walkover #1. Winners will be announced at the Groovin’ on the Green concert, before the music begins. You and your team will have all day to build/construct, but the effort cannot begin until daylight July 4th. Because we do not want large holes in the sand that harm our sea turtles ability to lay their eggs – we want to ensure a safe environment before and after our event for our turtles! Come Play in the Sand with us!